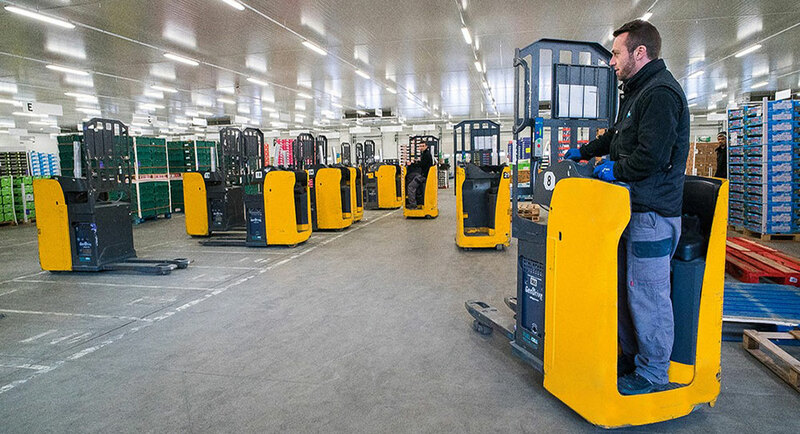 The French fresh produce logistics service provider has decided in favour of procuring a fuel cell-powered material handling vehicle fleet from Jungheinrich, which are manufactured in the Lüneburg production plant for special equipment. With this decision, the company underscores its expansive expertise in the energy supply of industrial trucks. Prelodis, which stands for Préparation Logistique Distribution, distributes around 270,000 tonnes of fruit and vegetables annually. For the development of the Grand Frais retail chain in the Paris region as well as in the north and west of France, Prelodis, the exclusive logistics service provider for Grand Frais, invested nine million euros in an 1,858 square metre distribution centre. Operator of the centre is Prelocentre, a subsidiary of the logistics service provider. With the logistics centre, which was built in October 2015 in Saint-Cyr-en-Val (Loiret) south of Orléans, the retail chain has also underpinned its positive image: considered as the highlight of the intralogistics solution is the material handling fleet that Jungheinrich modified to operate with fuel cells. Prelocentre uses the vehicles for loading and unloading trucks as well as for order picking. Philippe Giroux, president of Prelodis, which was founded in 2001, aims to increase the productivity of intralogistics processes by investing in the fleet. At the same time, he also aspires to protect the environment by operating the vehicles with green-certified hydrogen produced using renewable energy, thereby reducing carbon emissions. With the decision to use fuel cells, the need for battery replacement and the battery bay that the operator would otherwise have needed to set up is eliminated. All these advantages result in more comfort and safety as well as lower space requirements as no recharging stations are needed in the building. Moreover, the risks involved with changing batteries are also evaded. » Fuel cell technology is an economical solution for us as it allows us to make use of our material handling vehicles at competitive costs, « says Giroux. Giroux emphasises, Prelodis considered the fuel cell technology solutions of two manufacturers. Following intensive consideration and in-depth analysis of the subject, they opted for Jungheinrich. The fuel cells used are GenDrive units from Plug Power. The specialist and European market leader for fuel cell technology is Jungheinrich’s cooperation partner for the entire system, including vehicles, fuel cells and the hydrogen recharging station, whose terminal is connected to a storage facility outside of the building for the hydrogen. The project was preceded by an 18-month long study for which Jungheinrich established a project team in France. With its strong local presence, and in close cooperation with Prelodis and Plug Power, the team accompanied each project phase up to completion and provided 25 industrial trucks. First tests were carried out with an EFG 216 electric forklift and an ECE 220 horizontal order picker. In order to install the fuel cells in a shockproof and secure non-tilting manner, Jungheinrich adapted the battery compartment of the vehicles in accordance with the dimensions of the energy converter. As such, Saint-Cyr-en-Val is the first Prelodis logistics location in Europe working with fuel cell technology. The foundation for the swift realisation of the project is the partnership between Jungheinrich and Plug Power as well as the existing experience for the implementation of fuel cell technology in material handling vehicles. With the modification of the vehicle fleet, intralogistics solution provider Jungheinrich confirmed its expertise in the area of energy supply for industrial trucks – no matter if lead-acid battery, lithium-ion battery or fuel cell-based. Even for very specialised operating conditions, the production facility in Lüneburg for special equipment is capable of converting all new vehicles, which are designed for operation with 24 to 80-volt lead-acid batteries, to fuel cell operation. The desired modifications to the vehicles are carried out by the Customizing section of the Lüneburg plant. As part of this task, Jungheinrich provides complete certification in accordance with the European guidelines for the vehicle itself as well as the incorporated fuel cell, including all necessary tests and verifications. According to Giroux, what also spoke for Jungheinrich was that due to the cooperation with Plug Power, an integrated service concept was provided, ensuring smooth operations. With its qualified series-production vehicles, the company could also furnish test results warranting the performance and safety of its products. In addition, Jungheinrich also solved the issue of how to dissipate the heat generated during operation of fuel cells, by incorporating slots in the vehicles’ battery compartments. ESE low-platform electric pallet trucks are predominantly used at Prelodis, which employs approx. 300 staff and records annual sales of around 30 million euro. Furthermore, in Saint-Cy-Ren-Val, where around 80 employees will work, EFG 216 electric counterbalance trucks and ECE 220 horizontal order pickers will also be deployed – both of which have already proven themselves in the test phase. In regard to fuel cell service life, Prelodis expects a period of ten years. Giroux comments: » In terms of the payback period for the deployment of fuel cell material handling vehicles, we anticipate a timeframe of six to seven years. However, we expect an even shorter timespan in the case of larger numbers of such vehicles. In that case, the investments in the complex hydrogen infrastructure and the costs for regular maintenance would then be distributed across all the vehicles and subsequently allow for a faster amortisation period. « Also decisive for a swift payback period is that Prelocentre succeeds in the changeover from the current two-shift operation to a three-shift operation model. The outcome would result in the required cost efficiency being achieved, especially as no time for the otherwise necessary battery changes would be required. At the same time, it is imperative that the number of material handling vehicles reach the cost-effective level 50 and that the entire fleet is intensively used. Also contributing to the fast return on investment at Prelodis is the regional funding support for fuel cell vehicles, which is being provided. » The user-friendly solution chosen for the Saint-Cyr-en-Val site is a model for equipping other sites « summarises Giroux. It therefore comprises the basis for Grand Frais’ goal of tapping into fifty additional sales markets over the next five years. Should the company achieve this ambitious goal, the need for logistics services from Prelodis along with the demands placed on it will certainly rise.